South Beach developer Thomas Kramer has lost his party homes. Kramer’s lenders submitted the winning $40 million bid for his Star Island mansions on Tuesday. 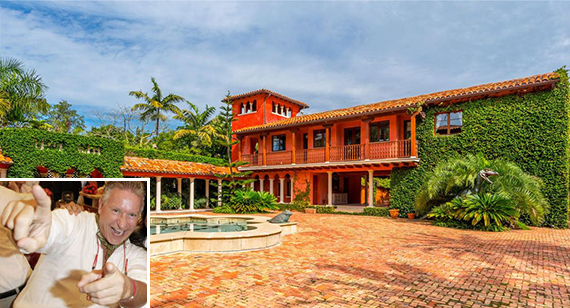 Verena von Mitschke-Collande and Claudia Miller-Otto won the auction for the adjacent properties at 4 and 5 Star Island Drive, according to records filed with Miami-Dade County Clerk of Court Harvey Ruvin. Both are the daughters of the late Siegfried Otto, who financed the purchases of the Miami Beach homes. Kramer was married to Otto’s stepdaughter for a “brief period of time,” according to a final judgment filed in June. Otto’s two daughters, von Mitschke-Collande and Miller-Otto, reached a settlement with Kramer in Swiss court in 1995 to collect the funds, and Kramer, a South Beach developer, failed to convince a judge to overturn the settlement. The plaintiffs won a $90 million judgment against him in 2000. At the time, a Swiss judge also ruled that Kramer had to turn over the properties, as well. Kramer was known for throwing parties at the Star Island mansions, and developed properties in the South-of-Fifth neighborhood. In 2001, Kramer transferred ownership of the waterfront homes to Skipworth Properties, an offshore company. Otto’s heirs tried to collect the Swiss judgment in Florida in the amount of $108 million, court records show. In June, Circuit Court judge Thomas J. Rubell ruled the plaintiffs held the lien of $192.35 million, including post-judgment interest. “The auction represented the climax of literally decades of litigation with Mr. Kramer and we’re gratified we got to that point,” said Chuck Throckmorton of Kozyak Tropin & Throckmorton, a bankrupcy attorney representing the plaintiffs. He declined to comment on their plans for the properties. Records show both homes sit on a combined 80,000 square feet, or about 1.84 acres. Kramer paid $2 million for the 12,000-square-foot mansion at 5 Star Island Drive in 1992, and $3.85 million for the 8,162-square-foot home at 4 Star Island Drive in 1996. They were built in 1996 and 1947, respectively. Few waterfront properties on the exclusive island have traded in recent years, but a handful are listed for sale. The former home of the late Lennar Corp. founder Leonard Miller and his late wife Susan Miller, a prominent Miami philanthropist, hit the market with the Jills for $49 million in May. Last year, Marco Iacovelli, the founder of Rally Manufacturing, listed his mansion at 46 Star Island Drive for $65 million. Other residents of Star Island include Stuart Miller, Phillip and Patricia Frost, and Gloria and Emilio Estefan. Kramer’s attorney, Mark Meland, could not immediately be reached for comment.